Commanding an imposing position above Plakias bay this two story architecturally designed and impeccably furnished mansion boasts ultimate south coast and mountain views, and the height of luxury living. Graceful and flowing it's architecture reveals expansive living areas, complete privacy, luxurious furnishings, and exceptional amenities throughout. Feel the cool tile underfoot as you stroll through this spacious estate. Workout in your own personal gym. Enjoy an early outdoor breakfast. Take a refreshing swim in the private pool. Keep informed and in touch with the high speed wireless internet and plasma tv with all your favourite satellite channels. End your day with a relaxing dip in the jacuzzi tub. 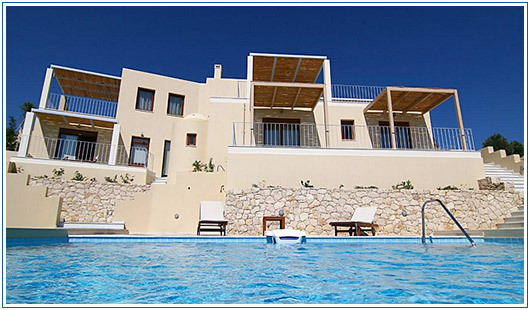 No matter where you are at Plakias Hill Mansion there is room for everyone. The main terrace includes the pool, shade structures, lounge chairs, and outdoor dining space. Enjoy gorgeous blue ocean views, fresh breezes, and stunning skies from every vantage point day or night. We believe a great deal of thought has been given to creating relaxation and fun for every guest at Plakias Hill Mansion. 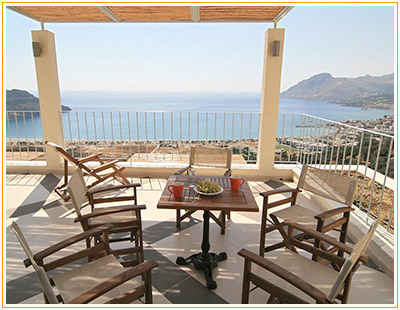 This truly is the ultimate choice for a private and luxurious holiday in Plakias. See our picture collection and decide for yourself.